I was first introduced to Kathryn's wittings while we (I and my wife) were enjoying a week at the 'Charlotte Gerson Health Restoration Center' in San Diego. At first bush the Gerson therapy and diet appear almost too simple - especially when someone else is doing it for you! While at the Center, I devoured everything on Dr. Gerson's work that I could lay my hands on. Especially interesting was meeting Dr. Gerson's daughter Charlotte. This alone was worth the trip! Her vibrant health at 85 was striking and it really was an honour to meet her. Like most people, we thought we were generally healthy* and had simply come to learn and enjoy the week. While there, we unexpectedly noted improvements in our own health even though we were their only for a week. This prompted us to continue the therapy when we returned. *As you will learn from the book that; "a healthy diet is enough to keep a healthy person healthy but is insufficient in reversing the effects of disease." Upon some digging and putting the therapy in practice it became quite clear that this innocuous sounding regime is anything but innocuous. While at the Center, we made the mistake of relaxing just a tad too much and did not take, the many, opportunities to do enough hands on juicing, cooking, etc.. Sadly this made setting up shop at home unnecessarily difficult. 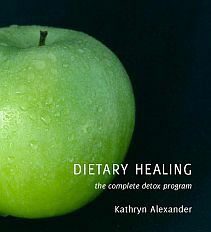 "Nutritional Healing: A Patient Management Manual" by Kathryn Alexander, was one book among many that I had purchased at the restoration center and it was my first introduction to her work. This manual became essential for really understanding the work of Dr. Gerson and it really helped in connecting the dots. I was enamored by the clarity of thought expressed in Kathryn's work. Aptly described by Charlotte Gerson as "the 'bible' of the nutritional healer of the future". This introduction, literally compelled me to read more of her work and I had to read DIETARY HEALING, hence his review. ..."Over the years I have watched a shift in patients' thinking where there is now a greater desire to take a more active role in decision-making regarding treatment. I have seen that the biggest problems arise when patients feel pressured by the medical system into either taking a back seat or making decisions while there remain unanswered questions. The main difficulties occur when cure cannot be offered, but in its place an option that could lead the patient down a path of greater drug-dependency. I have helped a great many patients through those difficult choices, and seen many remarkable improvements in health improvements that, from a medical perspective, could not have been achieved through diet alone. Above extracted for the post script. * Imagine what the success rate should be of non terminal patients! Kathryn unravels Dr. Gerson's work and further expounds on this indispensable understanding of disease, making it accessible to all. Here is a short 3 minute clip extracted from her 2 CD talk titled The Principles of Detoxification which makes a wonderful enhancement to the book and is a must listen. It also contains a question and answer segment. Unfortunately, one of the problems with the Gerson therapy is the need for rigorous application; it is designed for the most degenerative diseases of all. ""DIETARY HEALING" has gone to great lengths to make these time honoured Gerson principles "family friendly" so your whole family can enjoy the benefits of the diet." - Quite a feat! "What is health? Most people would say that health is the absence of symptoms and a feeling of well being. But health is a little more than this. If we take a closer look at the word health and remove the "th" we have HEAL, and this to me constitutes health - the ability by the body to heal itself or resolve imbalances naturally, without the use of drugs." "Disease is an adaptation to local conditions; by cleansing (detoxing) the internal environment at cell level we restore the conditions required for self-healing." "In health the liver should remove anything surplus to requirements or toxic to the body; this includes endogenous substances (made by the body itself, such as cholesterol, hormones, chemicals and the end products of digestion) and exogenous substances (environmental toxins such as heavy metals, agricultural and industrial chemicals, preservatives, dyes, colourings and medical drugs). If toxins remain in the body, then the immune system will attempt to remove the toxins from wherever they are lodged, and if unsuccessful will eventually lead to a "named disease" or may act as a carcinogen causing cancer. So the implications of inadequate liver detoxification on our health are enormous." "Detoxification through diet is a very old principle used by the father of medicine, Hippocrates himself. Down through the ages and up until modern times, many eminent physicians have employed these dietary principles in the treatment of disease and there is no doubt of their powerful and effective results. When the vital organs are detoxified sufficiently, the body's acid/alkaline balance re-established and the mineral and enzymes systems are re-instated, then self-healing can occur." "So why is detoxification different from other dietary plans? Detoxification means ridding the body of toxins or waste products that have accumulated over the years causing congestion and a clogging of the system. Toxins become tucked away, lodging in the cells, slowly inhibiting vital activities. Eventually, as more and more cells become toxic, tissues and organs start to lose their vitality and the symptoms of disease appear. To maintain efficiency, whether in a mechanical engine or a human body, regular servicing and maintenance is required. As soon as a system becomes overloaded and dirty then mechanical faults or symptoms of ill-health occur. "Detoxification, through the removal of toxins and the release of congestion, raises vitality. This vitality stimulates the body to repair and regenerate itself; disease processes are arrested, followed by the reversal of symptoms. Detoxification promotes and supports self-healing which is the crux of health. So for those of you who wish to regain health, or maintain the health you have, then detoxification will work for you." Here then is a clear and systematic approach, essential for rapid understanding and healing at the deepest level - an incredible gift! An exemplary resource that encapsulates in one book what may take years to learn! - Required reading. Does anybody out there have any knowledge of healing power of certain foods ( fruits, nuts, vitamins or special diets) for non-conventional treatment of autism. My grandson suffered infantile spasms (West Syndrome) at the age of 7mths. He is on standard anti-epileptic drugs. Daily mini-seizures continue. Though physically normal in every way (walking, running, kicking balls, sight and hearing) he has yet to utter any meaningful first words. He is 32 months old and is not yet potty trained. He has had all the EEG and MRI scans etc but everything appears to be normal. Can anybody , please help!! Signed Worried Grandparent.